At the Gardens, one of the more frequent remarks I hear from guests is how much they love the different combinations of plants used throughout our property. While each horticulturist has their own, unique way of designing, I hope to share a little insight into my process of choosing those plants and perhaps help to inspire you in your own gardens along the way! The first factor I always consider in my designs is the site itself. How much sun exposure a garden bed receives greatly dictates which plants are even a possibility. I also look for a site’s propensity to dry out or be wet, as that also dictates what plants will thrive. A recent weather trend in Boothbay seems to be very dry summers, with the geography of the peninsula meaning we often miss the rain showers other parts of the state are blessed with. Although we do have underground drip irrigation at the Gardens, the size of our system is to such an extent that each zone only runs two to three times a week – meaning that if we are in a severe drought it really isn’t enough for more moisture-loving plants. This has led both myself and many of my colleagues to shift our plant choices towards species that are more drought tolerant, hopefully only needing extra hand watering right after being planted while they are establishing. Think about your gardens and these microclimates before selecting your plants. Personally, I’m a big proponent of choosing the right plant for the right place: don’t plant something you’ll have to fight to contain or maintain, especially if your time in your garden is limited. Once I have a clear sense of the conditions in the area, my next focus is color combinations. 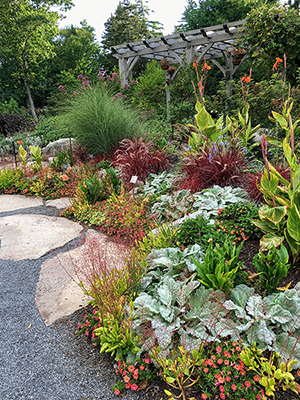 Working in a public space with many wonderful members and visitors who come back yearly, I try to change things up every year, both in terms of the plants themselves and also the overall color combinations. There are certainly favorite colors and plants I use year after year, but I try to limit those and change their location when repeating the same plant. There is one garden bed around the Great Lawn that I’ve loosely dubbed the “Black and Blue Bed” that I mostly choose black and blue flowers for, but I consciously pick new plants every year. One factor that often comes into play while designing here at the Gardens is our annual interpretive theme. Some years this translates into plant selection better than others, like during my first year here when the theme of Myth, Magic, and Medicine led many of my colleagues to choose medicinal plants or species known in different cultures as having or representing specific properties. This past year the theme was Botany for Butterflies, so all of my designs incorporated at least some plants that attract butterflies. If I’m using plants based upon a theme, often I’ll choose those plants first and build my design palette off of them. 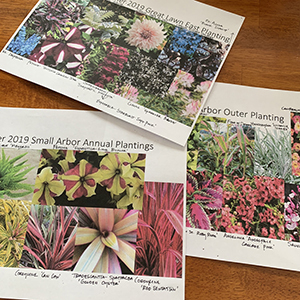 As a highly visual person, I find the method that works best for me to craft color combinations I find pleasing is to make a PowerPoint with pictures of all the plants I plan to use in a specific design. With PowerPoint, you can overlap or lay directly side-by-side all the photos and get a real sense of how those colors work together. Looking at many different sources for plants – from seed catalogs to companies that sell plugs or full-sized plants – it can be easy to get carried away with all the wonderful selections. But just because each plant is wonderful does not mean they will look wonderful next to another! I try to choose a few main colors to focus on, with an overall color palette punctuated by a surprising yet complimentary color or two. I take this approach in both with my annual designs and my perennial areas, such as adding allium bulbs in with a mass of ajuga to give an extra layer and longer season of interest. I’ll often plant simple annuals such as sweet alyssum (Lobularia maritima) on the edges of perennial beds to add some full season color to otherwise limited bloom-time plantings or add amaranth alongside earlier blooming perennials to give a late-season color boost to an area. I also don’t focus on bloom color only – foliar color and texture are hugely underrated elements. Just because a plant’s flower may not be its selling point doesn’t mean it isn’t colorful or interesting texturally! 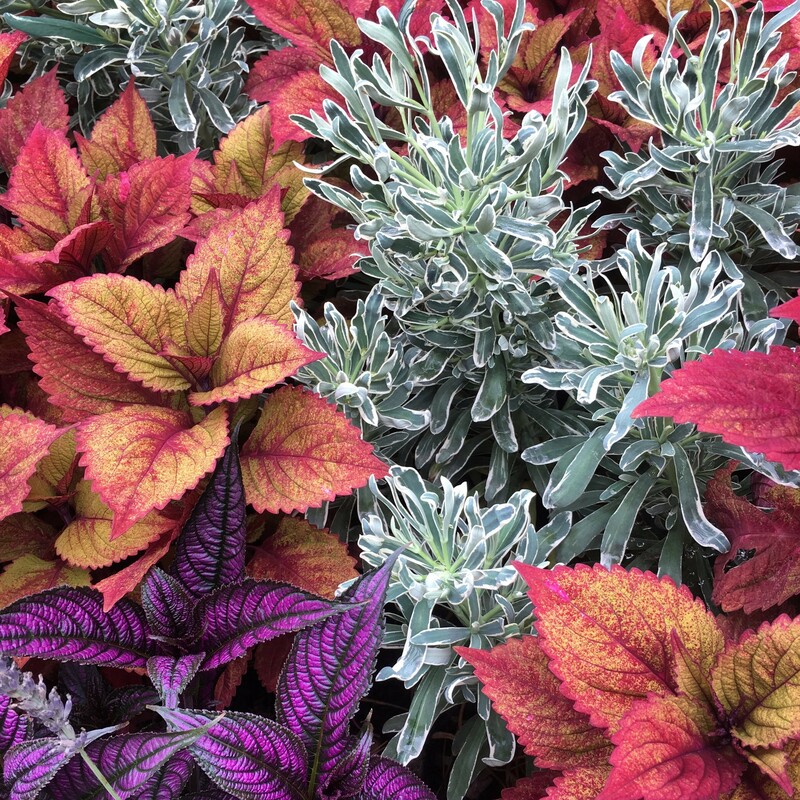 Not only is there huge availability in annual plants with interesting and brightly colored foliage (coleus, begonias, Alternanthera, or annual grasses just to name a few) but, unlike many flowers, they have little if any maintenance during the season since little or no deadheading is typically required. As any gardener will know, gardening takes a lot of time, so any way to cut back on work hours needed is a plus! My go-to formula is to pair long or full-season flowering annuals with annual grasses and interesting foliage plants. This creates a varied and interesting palette both color-wise and texturally and means you are assured color all season, even if you are between blooms. Finally, speaking of all season color, look at the bloom times of different plants. Many wonderful annuals take a little while to get going and really need heat to grow big and flower, such as dahlias, amaranth, or celosias. These make great choices for late summer through frost. Make sure you have some plants that will bloom right off the bat, such as pansies and violas, nemesias, and even ephemerals such as poppies. While they may not last the whole season, they can fill the gap between the early and late bloomers. Most important to me is to have fun and try new things. It can be easy to want to stick to your classics and favorites, but why not keep some of those while mixing in something different – perhaps your new favorites are yet to come!